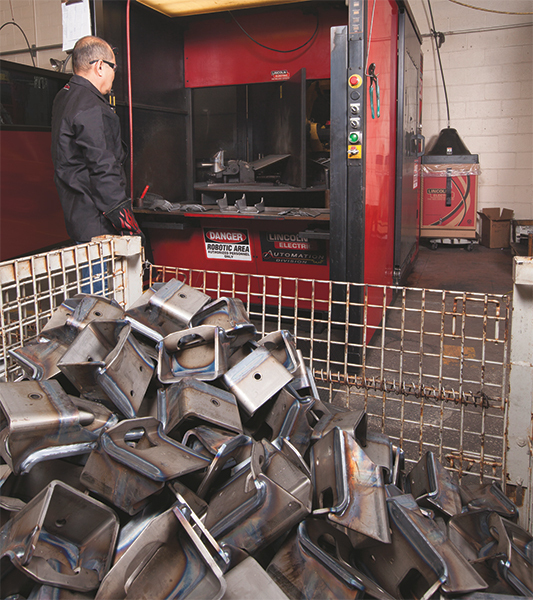 Among the stamped, welded and assembled components manufactured at Pioneer Tool & Die, a privately-held stamping facility in Akron, OH, are air-ride suspensions. Owner and CEO Walter Remen understands well that the company’s future relies on investigating new technologies to keep production in step with customer demands. Fitting the bill: robotic arc welding. Pioneer Tool & Die credits its new robotic arc-welding system with improving productivity by as much as 50 percent over previous welding operations. The faces of the robotically deposited fillet welds are consistently flat to slightly convex, with repeatable weld penetration and sidewall fusion. The company’s journey into robotic welding began with a visit by Remen and vice president of engineering Barry Foore to the Lincoln Electric Company’s Automation Division, for a look at its System 20 robotic-welding system. The standardized package includes a Fanuc ArcMate 100iC six-axis robot and a Lincoln Power Wave i400 power supply. To exceed cycle-time targets, Lincoln worked with Pioneer Tool & Die to enhance the standard System 20 with a Power Wave 455M power source, paired with a Power Feed 10R wire drive. Also included is extra input/output capacity to handle the Pioneer-designed automated clamping setups. Designed for small to medium-sized parts, the standard System 20 features a Fanuc servo-drive 58-in. two sided turntable positioner. Each work zone can handle weldments weighing as much as 600 lb. ; the turntable can index in 2 sec. For its System 20 cell, the Pioneer Tool & Die engineering team worked with Lincoln Electric to settle on pulsed gas-metal-arc welding (GMAW-P) as the process of choice. The use of Lincoln’s RapidArc pulsed mode of weldmetal transfer, notes the engineering team, helps to minimize spatter and improve cycle times for completed parts. The RapidArc program, compared to traditional pulsed-wave shapes, delivers a very tight arc length, say Lincoln officials, as well as higher travel speeds and a lower heat input. The program features a short-circuit response, which occurs with a high travel speed and tight arc length. Selection of the most appropriate RapidArc program depends on the welding wire required for the task at hand at Pioneer. The firm uses wire diameters of 0.045 and 0.052 in. to meet all of its robotic and hard-automation requirements. The wire of choice: Lincoln Electric SuperArc L-59 (AWS ER70S-6) packaged in 500-lb. Accu-Pak boxes. The faces of the required fillet welds are consistently flat to slightly convex, with repeatable weld penetration and sidewall fusion. 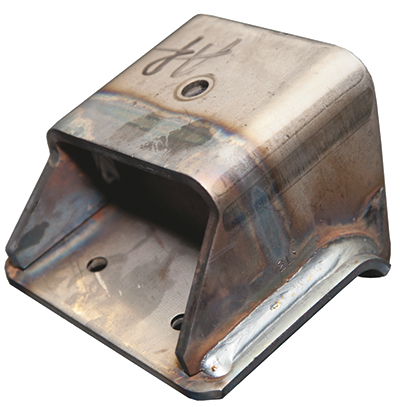 A key to decreasing cycle times is the use of Lincoln Electric’s Fast Start feature, a welding program that turns on the power source and locates the exact point of the start of the weld before there is contact with the part. This feature alone has accounted for a 6-sec. reduction in cycle time for Pioneer’s welded assemblies. Results of the use of the RapidArc program, according to the Pioneer team: an increase in productivity on the robotic System 20 by as much as 50 percent over previous welding operations. The successful use of the RapidArc process with its robotic-welding cell led the Pioneer team to try the process on one of its 10 dual-torch hard-automated welding systems. Known at Pioneer Tool & Die as box-welder systems, these setups use two welding arcs to fabricate the cylindrically shaped pistons used in air-ride suspension assemblies. The finished welds typically are circumferential and simultaneously deposited in the 2F horizontal position. Using the RapidArc program on the box-welder system resulted in a 30-percent decrease in arc time, significantly reduced spatter and decreased distortion, reports the Pioneer engineering team. The flexibility of the GMAW-P process and the hard-automation box-welder systems is demonstrated in one particular station where welding occurs simultaneously with one torch in the 2F horizontal welding position and the other torch positioned 180 deg. a and in the 4F overhead welding position. The latest box-welder system outfitted with the RapidArc process uses Lincoln Electric’s new Power Wave S350, a multiprocess, compact, inverter-based power source that operates at 120 kHz, reportedly making it the fastest-switching welding inverter power source available. Among its features is use of PowerConnect technology that allows the unit to automatically adjust to input power from 200 to 600V, 50 or 60 Hz, single or three phase. Information provided by the Lincoln Electric Automation Division, Cleveland, OH: 216/481-8100; www.lincolnelectric.com.